WE MADE IT… what more can I say. The feeling of riding through Herstal towards the FN factory was unbelievable. The years spent restoring Effie and those of dreaming about this becoming a reality, and now for it to be happening was almost more than I could believe. Accompanied by a large group of fellow enthusiasts and under sunny skies we chugged down the narrow street to the gates of the FN factory to where a welcoming committee was waiting to greet us. 14,606 kms – Nepal to Belgium and Effie did it admirably. No accidents, (apart from a slight brush with a rickshaw), no major mechanical failures on the road (just a few misdiagnosed problems), many broken spokes but no punctures and only two blowouts! What more could I ask for from such a wonderful old machine? Just a week ago I was leaving Bernkastel-kues and had planned to take it easy for the next day or two heading to Liege, hoping to savour the last stage of the ride through the quiet countryside. As it turned out I made better distance than I thought I would and late in the day realized that if I quickened the pace I’d reach Gouvy by nightfall. Isabelle & Bruno were surprised to see me on their doorstep a day early, but made me especially welcome. Our common interest in old motorcycles made up for any language difficulties and then there was always the internet translator to help when we got stuck. Once the fog lifted next morning Bruno and I set off for the Bastogne Monument, stopping off at his Dad’s workshop on the way. The star-shaped memorial at Bastogne is located close to the Luxembourg border and commemorates the 76,890 American soldiers killed, wounded or missing in the battle of the Bulge. And that doesn’t take into account all the other nations involved. It’s a somber reminder of the tragedy of war. Here Pascal joined us on his motorcycle so we three posed on the different Belgium motorcycle marques – a Gillet, a Sarolea and an FN. We rode to Marche en Famenne together, meeting Claude, another Moto Retro club member along the way. With heavy, skies threatening, Bruno headed back home, unfortunately missing the sumptuous Belgian meal prepared by Pierrette and Claude. I was presented with a couple of superb gifts created by club members Pascal Piron & Claude Van Denberghe. One was a wonderful replica FN agency sign, the other a beautiful model FN & rider with the inscription “Thank you for making us dream”. It seemed fitting to share a saying by Oliver Wendell Holmes…”Men do not stop playing because they grow old, they grow old because they stop playing.” The media were there for a couple of interviews and Lynne surprised everyone with a typical Aussie pavlova for dessert. A great evening was had by all with much laughter and the sampling of Orval beer. 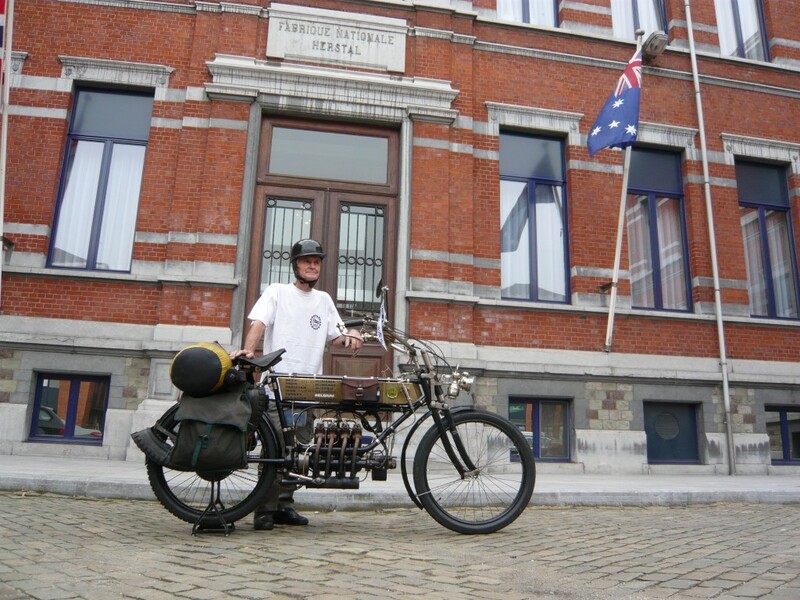 Next day I rode to Herstal accompanied by Claude, Michel & Pierre to pose for a few pictures outside the factory, only to be joined by the CEO of Ars Mechanica Foundation, Robert Sauvage, who invited us to the formal reception planned in a few days time. Despite the drizzling rain there was a sense of euphoria to completing the journey and that night Lynne and I were guests once again of the Belgium motorcyclists who showed us wonderful hospitality over more beers, famous Belgium frittes and local dishes. Thank you everyone! Then again on Friday 21st September 2012 it was with mixed emotions that I entered the grounds of the FN Herstal factory for the first time, where Effie began her life in 1910. The excitement that the dream had become a reality, a touch of relief it was all over, combined with a sense of enormous pride for what Effie and I had accomplished together in the name of FN. I was overwhelmed by the sincere enthusiasm & genuine support from everyone present, including members of Veteran Moto Club Belge along with the FN management & workers. My only regret was that Lynne was unable to be there to join in the celebrations due to severe pain in her knees, but she was with us in spirit. And what a celebration it was, with hundreds of photos taken before and after a splendid lunch amongst newfound friends & companions. Many toasts made and I was showered with presents for both Lynne & I, trophies and other wonderful memorabilia. I remarked that I’d arrived to settle a warranty issue and Robert laughingly responded that unfortunately the warranty period only applied for 100 years, not 102! This was a perfect time to remember all those I had met along the way, absent friends and family who’d helped make the journey possible and how much of a thrill it had been sharing something I loved with hundreds of people around the world. After our meal I enjoyed a guided tour of the showroom and the opportunity to see the direction the company had taken after production of motorcycles and cars ceased. A round of goodbyes and handshakes finished off what was a truly marvelous occasion. A special thanks to Michel Bovy & Robert Sauvage for making this all possible. Pierre & Martine were our gracious hosts for a few days, showing us a little more of the city of Liege and surrounding countryside. At the VMCB club meeting I shared a few pictures from my travels, only to be presented with more lovely gifts and was particularly touched when members played the Australian National Anthem during the evening. Now the time has come for Effie and I to stop and unwind, though it does seem strange and a little disconcerting not to be spinning her back wheel and jumping onboard for our daily ride. We’ll head home in a few weeks. Our house in Bali is sold and there’s much to do in finding a new home where I can set up my workshop and begin getting Effie back to her glorious self. Thanks to you all for following the Old Bloke’s blog. Creating the stories has been a joint effort relaying diary entries to Lynne each night, her passing on messages to respond to, and the both of us trying to make it all legible for our followers. Our daughter Nikki has done an admirable job of initiating and managing the website. There’s statistics and information still to co-ordinate and much more of the story to tell. We have already begun work on writing a book and we’ve a couple of new projects in mind for 2013/14. I invite you to revisit from time to time to see how it is all panning out. If it has inspired just one person to pursue their dream then it has been doubly worth it. The only thing to be afraid of is not doing something….everything else is possible. Did you get the newspaper from Poland? The article about you and photos of you on http://www.przedborz.com.pl were read over 1000 times in few days! I’m in Bali at the moment packing up our goods to have shipped back to Australia. I will check though with my son whose address it was to see if the newspaper has arrived and will let you know. Thank you so much for sending it – it will be great to keep in my archives of the trip. Amazing so many people read the article! Will be in touch. Thanks for sharing. Yes, great to have achieved my goal to ride Effie back to where she began. This trip was a long time coming but certainly worth the wait. Lots of adventures & fantastic people who supported me. Now we’re looking to life in Tasmania, working on a book and planning another journey for 2014. Plenty of fun challenges ahead. Congratulations on an Incredible Journey Ron and Lynn. Folks. This is one “Very Special” couple, whom I first met at the Gwrra 1980 Wing Ding in Phoenix,AZ for the first time and many times afterwards while traveling on their 3 years tour via their 1976 Honda Goldwing LTD. If the world in 2012 role modeled them, we’d have zero problems, just happiness. Thanks for the congrats and the kind words. We have great memories from all those years ago with you in California and hope we get to ride together again one of these days. There’s still lots of roads to discover…and a world full of wonderful people. Thanks for sharing all with us. Can wait for a book and who knows… maybe one day we can meet. Nothing it is impossible, almost nothing. Wish a sweet return home! Glad you enjoyed the ride and thanks for the good wishes. Do return to the blog from time to time as there will be updates and more adventures to be had. You are a hero. Please come and inspire us at the Adventure Travel Film Festival in Feb 15-17, Bright, Vic 2013. We’d love to have you and the bike there. We’ve all come from biking backgrounds and want to inspire. Thanks for the invite. Not sure about being a hero but I do enjoy hearing others have been inspired to follow their dreams after following my journey. I’d be happy to make it to the festival and will do my best to get my bike there once it arrives back in the country. On my return I’ll be living in Tasmania, so not too far away. Can’t respond more than that…got tears of joy in our eyes…can’t see the keyboard…!!! YOU DID IT…and we knew you would. Lots of love and many congratulations. Hard to believe it was over a year ago the four of us were enjoying a curry in Tassie and laughing about the proposed trip. Have to say the time went fast once I got going and great to know that you were there cheering me on. Look forward to meeting up again soon. Thanks for all your support. We have not met but it’s been an absolute pleasure to follow your journey on this blog and to get a feel of the joy you have had from both the journey and your bike; it comes across very clearly how much you love your FN. One question: your calendar shows you aim to be in the UK on 25th December this year – does that still stand? All the very best for your future endeavours!! Always good to hear people like yourself have enjoyed reading about my exploits. It’s true I did enjoy a great relationship with Effie. Maybe that has alot to do with being alone with just the bike for company but her endurance truly amazed me. While I thought she might be good for 10,000kms, when we reached more than 12,000km it became a little scary as to whether she’d hold up or not. I take my hat off to the engineers of yesteryear – they really knew how to build a robust engine and just with a little tinkering each day she came through for me. I was originally planning to go on to the UK after Europe but with winter approaching I’m not sure I’m that keen now to be somewhere cold. I’ll likely be in the UK in 2013/14 then on to the USA once I’ve got a new home sorted and Effie’s motor running smoothly again. Maybe we’ll see you then? You will be much better off back in Oz before the northern hemisphere winter fully kicks in. I usually pick up on motorcycle news via the Horizons Unlimited bulletin board, so if you post on there about future plans that would be great. Glad you enjoyed the blog. I haven’t been on Horizons Unlimited for a while but will try to find time in the next week or two to send in a report to let others know I’ve completed my journey. Do watch here for updates from time to time. Thank you Ron so much for taking your time to write and pass your experience to us readers, and thanks to your supporting team that made this blog so I could follow your fantastic journey! I am so happy it went well! Glad you enjoyed following my journey. It’s been amazing to learn how many people were there waiting for the next episode. There’s a lot that didn’t make it to the blog so I think a book is in order. I’ll keep you posted when that happens. Thanks again Charlie for your continued interest and all the best to you. Congratulations. You are a hero for me. Beautiful journey, beuatiful adventure. Beautiful and strong character. Beautiful machine. Respect from Poland which you visited so close to me. In Bielsko-Biala. Best wishes to your remarkable wife too. Thanks for your kind words and good wishes to Lynne and I and Effie. We made a good team! I had a great time in your country and heartily recommend a visit to Poland to other motorcyclists. Thanks for your comments. I sure hope I live to have a few more biking adventures. Looking forward to checking out the UK in the next year or two, being that it’s the home of motorcycling. All the best. hi ron congratulations on your achievment awsome is the only word i’ll try and make contact when you return and look forward to meeting up again surely there have been no feats like yours on 1910 technology when people were vertually still experimenting safe home kind regards to yourself and lynne thanks for the ride wal cheers! Yes, some of the technology was amazing in its day. have enjoyed checking out many old machines this past week or two and some of the designs were diabolical. Lynne & I send our best regards & look forward to catching up again in Oz. I’ve followed you from the beginning. From one vintagent to another I salute you! Thanks Robert. Glad you could share in the adventure and hope still you get as much enjoyment riding as I do. Pascal & Claude seem to have found the perfect phrase, “Thank you for making us dream”. I certainly can’t think of anything better. My Dad survived the Battle of the Bulge and the rest of the war to die peacefully just over a year ago. So thanks, also, for stopping by Bastogne. Glad I got the opportunity to visit Bastogne. Amazing how much of an effect these memorials have even for those like me who were not directly affected. Thanks for your congratulations – it’s only looking back now I wonder what the heck I was thinking, but we did it. Looking forward to seeing some sunshine – it’s getting a bit chilly here. Very impressive to see that old bike make it all the way…. Thanks for your support. Have some great photos of the day, but this one said it all I think. Loved the Aussie flag! As I read this final installment of what has truly been a journey of epic proportions, I had tears of happiness for you all welling up in my eyes. You have done so well and by living your own dream, have inspired and brought such joy and excitement to so very many along the way. It just shows what can be achieved if you hold on real tight to your dreams, just give them a real good go and don’t take no for an answer. Very much looking fwd to catching up with you in Tas, it will be a very special time indeed. So…Gumball Rally in 2013 then ? (East to West across ‘Merica for motorcycles made before 1930 – check out http://www.motorcyclecannonball.com. The 2012 one has just finished in San Francisco. See you soon you guys, enjoy your most well deserved festivities and have fun – its now time to let your hair down! You know how much this ride meant for me to do. Not always easy to stick to the plan but I had a great team behind me. Looking forward to catching up real soon. Have followed the Cannonball run this year – looks great fun, but not something I can do on a timetable. Working on something though for 2013/14 depending on how the next few months pan out. Lots happening and many decisions to make. Fingers crossed it’ll all fall into place. Congratulations on your epic journey, from one old biker to another old biker. Derek. Thanks for your congrats. Hope you’re still enjoying riding. We’re never too old I reckon! It meant alot to have you guys along for the ride and glad you enjoyed the blog & pictures. Still have some photos to update – will get to them soon hopefully. Winding down now and making arrangements to return. Lynne & I are looking forward to seeing you both again. Thanks Libor & Helena – it was a day to remember. Just visited ‘Yesterdays’ showroom, what a fantastic place. I was drooling over so many unusual bikes all in one place. How nice to read your ‘final’ episode and the story of your last days of travel before getting inside the FN factory. I felt it as a privilege to join you in your final leg on my 1907 FN single, a smaller, but older brother of your four, it was definitely worth taking a day off from work. I was very pleased to see the group of enthusiasts welcoming you with more Belgian bikes (not only FN, but also the competition, Saroléa, Gillet, Brondoit,… oh how great the Belgian motorcycle industry was in those days…). It was certain that the people at FN appreciated your effort, they were clearly very interested. Good to see the smartly dressed FN CEO and other directors admiring you and your bike, and enjoying that as much as the factory workers in blue working clothes. One word for your trip and the ‘finale’: fantastic ! I hereby award you a non-material award, one of ‘outstanding and extraordinary FN-manship’. I surely look forward to your book and wish you and your wife the very best in your future travels. Was great to have you along for that final run to the finish – what a day it was. Hope your boss didn’t read your post! LOL Sure was a fantastic turnout by bike supporters, FN directors and staff – very much appreciated. We’ll see you in Ostend – heading that way soon. Amazing…..I’am lost for words….Czech FN friend! Yes, the FN is a wonderful machine and it went so well considering the conditions at times. I did love some of the Czech Republic marques when I was there – amazing technology. I specially enjoyed the Transport Museum in Prague with it’s fine collection of motorcycles. Hoping you’re still getting some good riding weather on your FN. Yes Ron, Effie made here return to her birth place and it was an superb trip for you and the bike, as you see “we from Belgium” we could built very good bikes and they lives longer than 100 years :-). My youngest bike is from 1933 so I’ve got a good 21 years to go before she is 100 years old but then Effie will be a good 123 years old. But with a small overhaul some news piston and a good poor of quality oil se will runs like a sewing machine. I’ve got a movie film from the man from Finland with his m 11 500 sv who takes the right shot on the way you throw Effie to live by simple turning the rear wheel. The Japanese racing engineers does the seam with their bikes: I saw that ounce in Franchorchamps and it is amazing to see white gloves racing overall and just a small turn and they runs, but not so nice like Effie on her 4 cylinders. It was a pleasure to meet you and when you are around Bruges we got a lot to speak, mostly will be about FN, but Bruges is also amazing to see. Yes, Belgium sure did build very good bikes. Funny to hear how everyone finds it interesting the way I start Effie. Sure beats pedalling! Do you know anyone who sells aluminium pistons? I’m currently enjoying the Netherlands, will be visiting Bruges soon and will give you a call. Thanks for your good wishes. I wish you could have been there also. A legend in my own lunchbox. LOL! Looking forward to seeing you again soon.